SKICROSS NEWS - Sochi 2014 Winter Olympic champion Marielle Thompson of Canada and France's Francois Place captured skicross titles Saturday at the World Freestyle Ski and Snowboard Championships. The showdown at the Solitude resort near Park City, Utah, saw Thompson fill one of the few gaps on her resume with a first world title. It comes after the 26-year-old tore two knee ligaments four months before the 2018 Pyeongchang Winter Games - where she finished 17th little more than a month after she resumed skiing. Thompson roared up from third place at the first intermediate mark to win ahead of current World Cup leader Fanny Smith of Switzerland with France's Alizee Baron third. "Going into the second-to-last corner I thought maybe I could generate some speed on the outside, and thankfully it worked out for me," Thompson said. "Coming back this season I feel like I’ve been building my skiing back up at every race. So to come here to the biggest stage of the season and come out on top, I’m overjoyed." Place, who took bronze at the 2017 World Championships, momentarily looked to be in trouble when he soared almost twice as high as his rivals on the final feature out of the start section and came down awkwardly into the first straight. 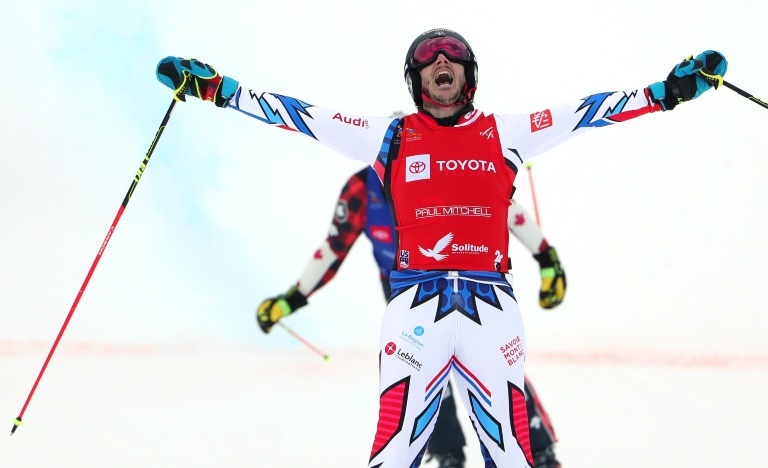 But he got his skis underneath him and seized the lead into the first turn, and led at ever intermediate mark on the way to victory over Canadian Brady Leman, gold medalist at Pyeongchang. Canadian Kevin Drury was third. "It was an incredible race today," Place said. "It was a little tough this morning with the weather and the wind, but in the end it was a great day. To be the champ, it's cool." Tess Ledeux made it two golds on the day for France with a victory in the ski big air - added to the World Championships program for the first time in the wake of the International Olympic Committee's decision to add ski big air to the program for the 2022 Beijing Winter Games. The 17-year-old added the title to the slopestyle world gold she won in 2017. A huge first run that scored 94.75 points put her on the way to victory in the competition in which the best two out of three runs count toward a skier's total score. She was already assured of gold before earning 90 points for her third run for a total of 184.75. American Julia Krass took silver and Britain's Isabel Atkin claimed bronze. Switzerland's Fabian Boesch won the men's big air title ahead of Sweden's Henrik Harlaut and Alex Beaulieu-Marchand of Canada.